MultiEPG provides control over a large number of networks and multiplexors, unlimited number of services and transport streams. It can function within any complex configuration of network with various models of multiplexors. 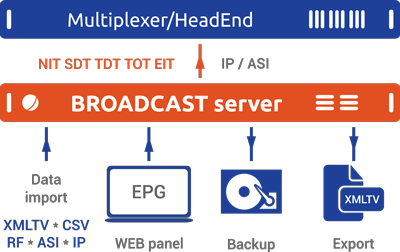 System complies with DVB standards and specs for TV broadcast (ETSI EN 300 468). EPG server secures generation and management of unlimited quantity of services, transport streams, multiple networks and multiplexers. Functions in any complicated network configuration with various multiplexer models from different manufacturers. System is compliant to DVB specifications. EPG server is easy and beneficial to use for generating service information, in case operator’s hardware does not allow to accomplish it or does not do it well enough. EPG server is Stream Labs software installed on operator’s Hardware. All parameters are managed via WEB panel. No additional Software is required to be installed on operator’s computers. Internet browser is sufficient. SL EPG server generates DVB-SI service information: NIT, SDT, TDT, TOT, EIT. Network Information table (NIT) — is mandatory DVB table. The NIT conveys information relating to the physical organization of the multiplexes/TSs carried via a given network, and the characteristics of the network itself. NIT PID = 0х0010. Service Description Table (SDT) — is mandatory DVB table. Each sub_table of the SDT shall describe services that are contained within a particular TS. The services may be part of the actual TS or part of other TSs, these being identified by means of the table_id. SDT PID = 0х0011. Time and Date Table (TDT) — is mandatory DVB table. The TDT carries only the UTC-time and date information. TDT PID = 0х0014. Time Offset Table (TOT) — is mandatory DVB table. The TOT carries the UTC-time and date information and local time offset. TOT PID = 0х0014. EIT other TS, event schedule information = table_id = 0x60 to 0x6F. EIT PID = 0х0012. OTA / SSU - subscribers’ receiver firmware “On The Air” update module can be included in BROADCAST server kit. Technology and parameters for broadcasting OTA /SSU for specific receiver are defined by manufacturer specification. DVB SI data stream is fed to operator’s Multiplexer (HeadEnd, Modulator) via IP or DVB ASI interface. After Multiplexer setup, DVB SI tables enter DVB network. As a result, subscriber’s receiver obtains information about network, services, program guide, UTC time and local time shift. DVB-SI generation module is written on “C” to provide maximal service stability and availability. Entry level servers can be used as Hardware platform for BROADCAST server. Server secures EPG generation practically in any languages, in multilingual digital television networks. Server management panel has multilingual user interface. OTA / SSU – subscribers’ receiver firmware update. Secures centralized DVB SI management and generation for several networks simultaneously. Compliant with any headends and multiplexers. Flexible and scalable software/hardware architecture. Convenient and intuitive web interface. SI table generation settings individual and independent for each TS. EIT tables generation period management. EIT tables generation speed management. Event information input and editing. Automatic EPG import from external sources. EPG export it XMLTV format. Swift and “painless” system commissioning. Works on general purpose servers, use Hardware you own. Full installation, configuration, commissioning service. We offer, to launch a Demo EPG server in Your network for 1 000 USD**, to test Your hardware and get You familiarized with its capabilities. You have to prepare a computer or virtual machine, install Ubuntu Server 12.04/14.04 and open access via SSH. We will install software, configure server, help configure Multiplexer/HeadEnd and provide a program guide for testing. You will receive a fully functional EPG server in your network and will be able to test it and manage parameters in first-person. **in case of purchase, amount will be subtracted from final bill. generation SI tables: EIT, TDT, TOT. Generation SI tables: EIT, TDT, TOT, SDT, NIT.